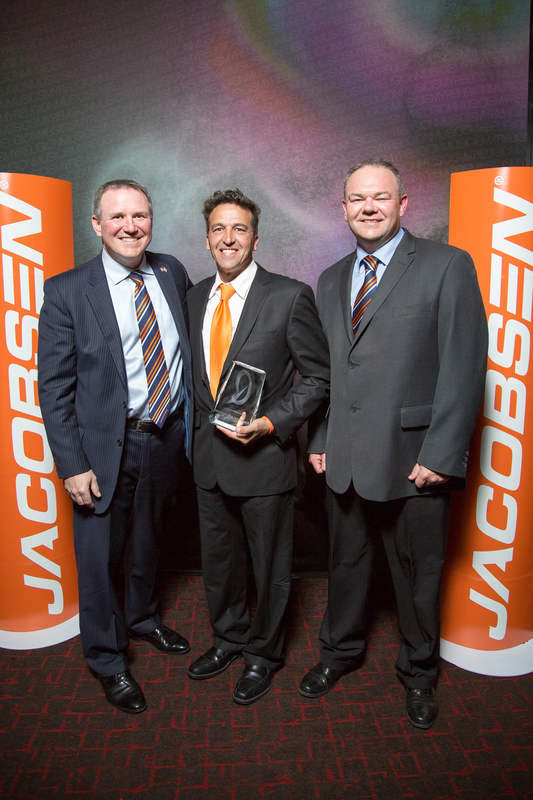 Australian dealers and Jacobsen staff were recognised for their excellence at Jacobsen’s 2016 Awards Ceremony during the Golf Industry Show in San Diego recently. 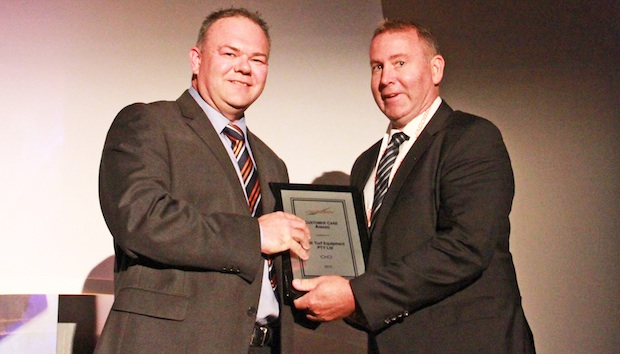 ADE Turf Equipment Pty Ltd (main picture), based at Chelsea Heights in Victoria, was presented with the APAC Customer Care Dealer of the Year award by Ransomes Jacobsen’s Customer Care Director Jason King. “ADE has demonstrated the importance of working closely with their customers. They embrace new technology and provide clear and concise information to the manufacturing facilities in the USA and UK via the Customer Feedback process. Recognising the importance of training, they not only invest in their own technicians’ development through factory training, they also provide training for their customers. McIntosh and Son, Jacobsen’s dealer for Western Australia, were also recognised and will receive a framed certificate in appreciation of 25 years loyal service to the Jacobsen brand. 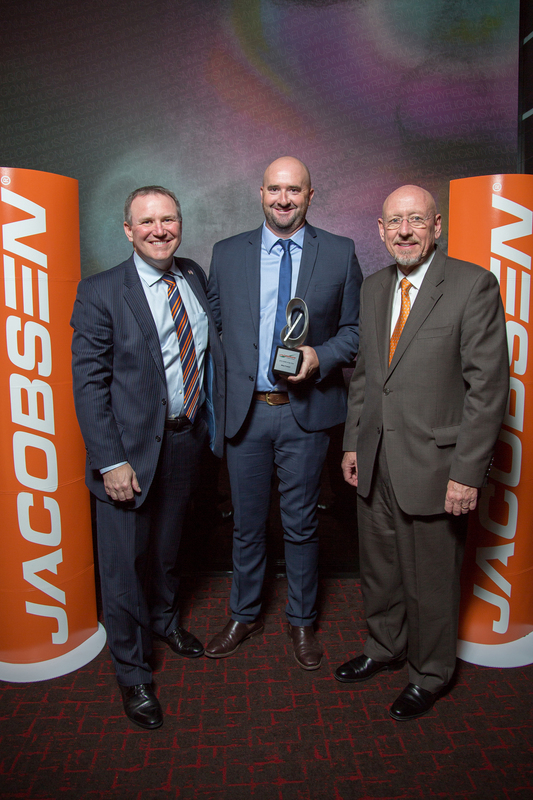 The APAC Outstanding Service award was presented to Jacobsen’s Product Support Manager Ray Grech for his dedication to the APAC dealers in SE Asia, Australasia and Pacific Islands. “I first met Ray around 9 years ago when he was working for our distributor. Recognised as the industry expert and ‘go to guy’ for golf course technicians, he joined Jacobsen in 2010 from the outgoing dealer. “Today he continues to support his territory and remains a well-respected industry expert and member of our APAC team primarily looking after Australia and New Zealand for technical support. The final award went to Jacobsen’s Mike Foskett. He was presented with the APAC Regional Sales Manager of the Year award by Jacobsen’s APAC Managing Director, Chuck Greif. “Mike is the consummate groundscare professional and previously worked for our dealer in Western Australia before joining Jacobsen in June 2013,” said Greif.